SENTIO VR is the simplest way to present 3D models in VR. With a few clicks, you can create 360° tours or 3D walkthroughs and immerse your clients inside your designs. No coding or installations are required. SENTIO VR makes the process simple and intuitive to upload your 3D content, create walkthroughs and present in VR devices like Oculus Go or Samsung Gear VR. 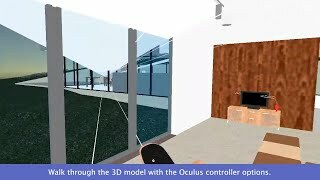 Sentio VR for Autodesk® Revit® plugin can step inside your Revit model in VR devices in a few clicks. SentioVR also works with SketchUp. Optimization for all the models.